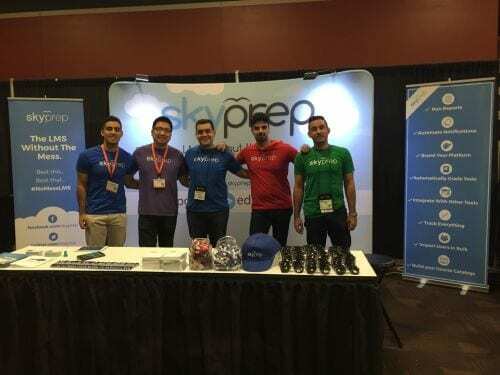 Last week, SkyPrep had the opportunity to be a part of the DevLearn 2015 Conference and Exposition in Las Vegas, Nevada. We were very excited to meet and talk to potential new clients and partners as well as having the chance to gain some insight from training industry professionals. Conferences like DevLearn are always important to us because it allows us to gain information about the wants and needs of people in our industry. Learning about the problems companies and individuals face, and discovering ways to solve these problems, using unique and different training techniques, is the quintessential way we improve as a company. We discovered how specialists in the LMS field are adopting more informal training methods with the use of mobile and tablet devices. Everyone is always on-the-go therefore, the industry is gearing towards fast, effective and on-the-go training and learning. We were surprised to discover that most people were unhappy with their current LMS system, despite the large amounts of money they were spending on them. It was great knowing that SkyPrep can help solve these individuals training needs by offering our ‘LMS Without the Mess’ platform at a more affordable cost. The conference made it very clear that the LMS market has become increasingly saturated. A healthy dose of competition not only forces companies to constantly evolve and improve in order to stay a part of the game, but it also shows how the eLearning industry is rapidly growing. Ultimately, we’re in this field to help companies and individuals with their training needs, and learning from everyone else and being a part of the whole process is what makes us love what we do. Overall, the conference was a great success. We’re happy to welcome the new friends we’ve made and are looking forward to meeting more at DevLearn 2016. Till next time!